My So-Called Life was the first show that understood me; a statement that sounds grand and ridiculous but one I hold to be true at both the ages of 14 and still at 30. After rewatching it for This Was TV recently I realized that it isn’t just the teenage version of me that can connect with this show and its characters, it still resonates today and a lot of this is to with Claire Danes. Danes is back on TV in another iconic role as Carrie Mathison on Homeland and while I haven’t felt compelled to write about Carrie in my journal in the way I did about Angela Chase (also I don’t have a journal anymore), Danes has helped create a character that is just as mesmerizing to watch. The big talking point of this Vogue interview and theme of the editorial is Homeland (this isn’t particularly surprising as the show returns in September) and co-star Damian Lewis appears alongside Danes in some of the shots. The interview takes a look at Danes’ career as a whole – from her teen performance on My So-Called Life, to the incident that got her movies banned from the Philippines, her decision to go to college, why she did Terminator 3: Rise of the Machines and how Temple Grandin was incredibly rewarding but she struggled to get work after this award winning performance. Next came Homeland and Danes had a decision to make when it came to the audition as she was also up for the role of Leonardo DiCaprio’s secretary in J. Edgar, it turns out it wasn’t a hard choice to make as Danes tells Vogue “I was like, ‘Do I want to play the secretary to the boss man or do I want to be the boss man?’ I want to be the boss man.” Also if Danes and DiCaprio are going to appear on screen together I think it needs to be something more than what this part in J. Edgar could offer. Last night I watched the Claire Danes movie Evening for the first time; a film which has some pacing problems and the odd overwrought emotion, but one that I found compelling overall thanks to the incredible cast. It was on this set that Danes met husband Hugh Dancy and in a house that includes Carrie Mathison and Will Graham this quote from friend and actress Gaby Hoffmann about Danes and Dancy is brilliant “It’s amazing she found someone who loves crafts as much as she does.” The shot below is from Evening and the striped bathrobe and Panama hat combination Dancy is wearing is too good to resist posting. Despite being set in the 1950s Dane’s costume of a white blouse and full and flared patterned skirt are on trend and it’s something I could definitely see myself wearing as this hot weather persists. One person who has know Danes for as long as she has been on TV is My So-Called Life creator Winnie Holzman and she articulates perfectly why Danes has such a strong screen presence “Claire can be awkward and graceful and beautiful and not so beautiful and tortured and calm, and we have all that roiling inside of us, but we are so often typed or labeled. Sometimes we watch people who we want to learn from or be a little like.” This is probably why Holzman created a character that still resonates and means something almost 20 years later (yep My So-Called Life turns 20 next year, let that sink in for a moment). Plot wise Homeland stumbled last season and while some aspects of the show come across as ridiculous at times (including the central love story) Danes is still incredibly effective. One scene that really stands out is from the episode “State of Independence” as Carrie descends into the darkness and chooses to die, it’s an incredibly tough sequence to watch and it feels like an eternity for Carrie to change her mind and save herself from this decision. Much has been said about her ability to show raw emotion and to not hold anything back and this is part of her appeal. Danes talked to Elle magazine about how uncomfortable she is with the fascination her cry face generates “I have to say, I find it very odd that it’s been sort of objectified. It’s just the way feelings register on my face. It’s not calculated; it’s not an aggressive gesture. It’s been isolated from the rest of my work, like a tacked-on thing. It’s not.” I’ll repeat what I said over at This Was TV and that we point it out because “your chin quiver makes my chin quiver.” It’s moments like this in all of the roles that Danes has played that allows the audience to connect and why characters like Angela Chase and Carrie Mathison matter. 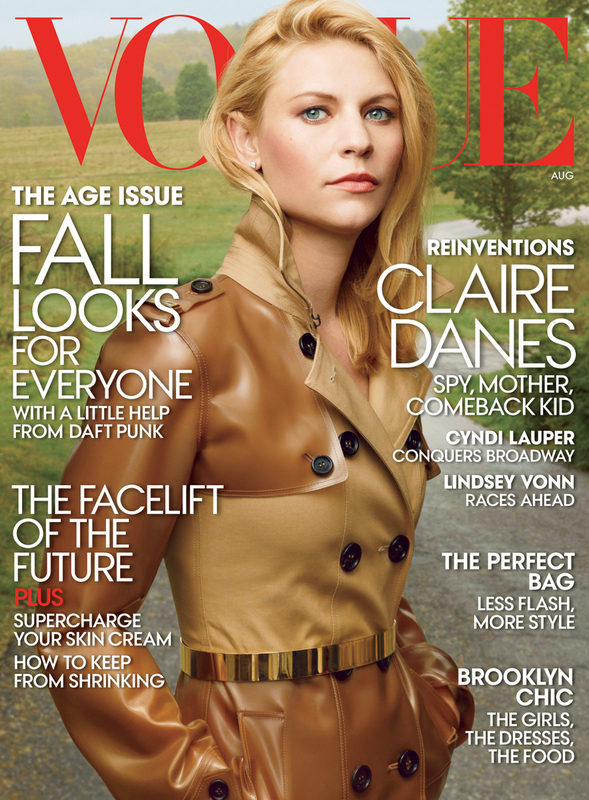 The August issue of Vogue hits newsstands July 23 and Homeland season 3 premieres on Showtime Sunday, September 29.